Finally! I recently came across this great analysis that the OECD (the Organization for Economic Co-operation and Development) did to show how well off workers in different countries are after adjusting for income and entitlement taxes, like social security and health care. Basically, it measures what people get paid for a fair day’s work. And we’re not talking average household income here. Household numbers are affected by choices: whether both spouses work full-time, one part-time, or one not work at all… Female participation rates AND the number of kids one chooses all have an effect on per capita numbers. Looking only at individual incomes gives us the clearest picture we can get (with some caveats, which I’ll discuss in a minute). Check out this chart from the OECD. It looks at total average wage income, the total tax rate to deduct from that income, then the net average wages. Notice how Australia has an asterisk and double numbers. It doesn’t have social security but instead (and what I believe is a better system) superannuation. The Oz government requires individuals to place a flat 7% of their annual income into a fund that they manage within rules and guidelines, and use that for their own social security. So, I added that 7% to the total tax rate and reduced the reported numbers in this table by that. Focus on the second net wages and tax rate. The top four for net wages are Switzerland at $58,864, South Korea at $44,892, U.K. at $41,608 and Japan at $41,139. Japan’s problem is low overall labor participation rates due to aging slowing its economy and generating lower GDP per capita. Switzerland has the highest cost of living, which substantially offsets its high gross and net income. The bottom four are Greece at $26,022, Italy at $29,793, Canada (surprisingly) at $31,639, and Spain at $31,916. Greece compensates a bit by having the lowest cost of living, as does Spain. 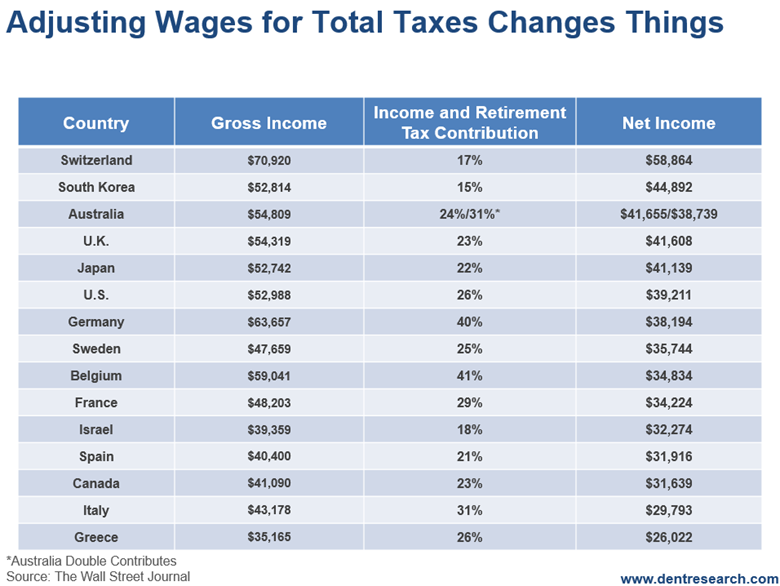 The lowest tax rates, in order, are Korea, Switzerland, Israel, and Japan. Those with the highest are Belgium, Germany, Italy, and Australia (if you count its superannuation at 7%). And keep in mind that in Italy health care is essentially free, even before retirement. There’s another factor to consider: cost of living. The three most expensive places to live are Switzerland, Australia (due to its housing bubble), and Israel. Two of the three countries with high costs of living also topped the chart for highest gross and net income. Israel falls short with an average net income of $32,274 per individual while being one of the top for comparative costs of living. The cheapest three countries to live in are Greece, Spain, and Korea. So, that boosts their real net income a bit. To sum it up: the countries with the best income, adjusted for taxes and cost of living, for a single worker, in order, are: Korea, Japan, Switzerland, U.S., and Germany (with the U.K. just behind Germany). The worst are: Israel, Italy, Canada, Sweden, and Greece. In the U.S., we come out well above average, but certainly not on top.